Harvesting by machine is the most efficient method to pick grapes. The machine harvesters are huge, elephant-size devices that straddle the vine row. The vine rows must be a specific configuration – spacing, trellis design, and height – to accommodate the machine harvesting. Row elevations are significant. There are some vineyards on extreme slopes that the machine harvesters cannot negotiate. The machine harvester shakes the grapes off the vines, passesthem up and over an adjacent row and deposits the fruit into a gondola towed by a tractor. It is a precisely-choreographed operation where harvester and gondola must move at exactly the same speed, although both are in different rows, proceeding down the row at a slow pace. There are three different types of machine harvesters: self-propelled, harvester towing a truck, and self-contained, where the fruit is retained in the harvester until it must be dumped. The picture to the right, shows a self-propelled harvester. When the gondola is full, it is towed to a waiting double-trailer containing four larger six-ton bins. 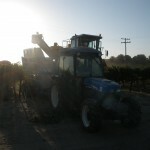 The gondola load is deposited in the larger bin and the tractor/gondola unit returns to the vineyard for its next load. In the meantime, another tractor and gondola have moved in to keep the harvester moving while the first is dumping its load. The process repeats until the harvest is complete. The harvest itself for each varietal is accomplished in one night. A truckload consists of two trailers with two bins on each trailer. When all four are filled, the truck is ready to transport the grapes to our winery customer. An advantage to the winery of machine harvest is that there are fewer stems in the harvested fruit. As part of each machine harvest, we select fruit for our ViñAlegre wines. 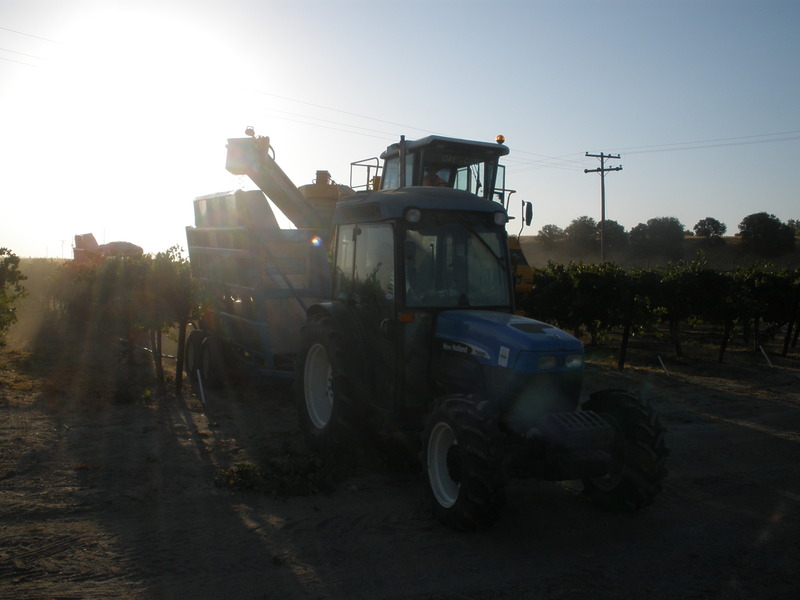 The machine harvester fills our half-ton bins, which we transport to our winery in Paso Robles for processing.